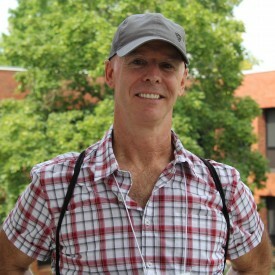 William DeForest is a graphic designer, artist, and career educator with 25 years of teaching experience in higher education. His background in fine arts includes printmaking and drawing, and he currently works in oils on paper. As a designer, his interest is in working with the community and not-for-profit organizations to promote local economies, social justice and sustainable, earth-friendly practices. Currently, William is working with student groups to develop graphic standards, info graphics, and visual timeline pieces for the Matilda Joslyn Gage Foundation, in Fayetteville, New York, in coordination with Syracuse University professor Sally Roesch Wagner, Director of the Matilda Joslyn Gage Foundation. Other recent projects include calendar designs for the Onondaga Environmental Institute awareness raising campaign “Reviving Place: Onondaga Lake Watershed Community Mapping and Environmental Planning Education Project”, reflecting the value and meaning of local waters to community residents. William moved to Vermont from Oswego, New York, on the shores of the Lake Ontario in the Central New York region. His personal interests include sociology and history, sci fi, hiking, canoeing, cross-country skiing, and horseback riding. Among his passions are gardening, cooking, and canning. He plays the banjo, albeit badly.